When thinking about buying a new food processor, I want to look for the following. A sturdy made processor bowl that has a decent capacity(1.5 litres). By sturdy, I don’t just mean the thickness of the clear plastic but also a bowl that doesn’t have too many little bits that can break off it and render it useless. As you can see from the photo this bowl only has one sturdy tab on it. A multifunctional device because most kitchens are too small to have a separate machine for each purpose. Well, take a look at the photo at the top of this post to answer that one yourself. 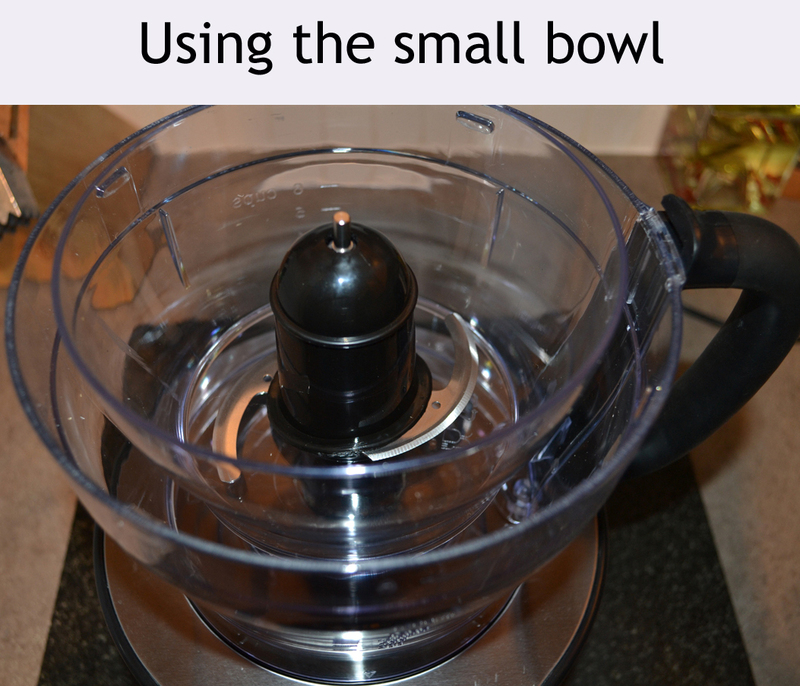 This food processor doesn’t just have one food processor bowl but two and even better the smaller bowl slots right inside the large one. A clever design making it easier to use and store (see photo).The small bowl is an ideal size to puree pesto’s, baby food or salsa’s. The grinder (or mill function as the instruction book call it) can grind coffee beans, herbs and nuts easily and quickly. 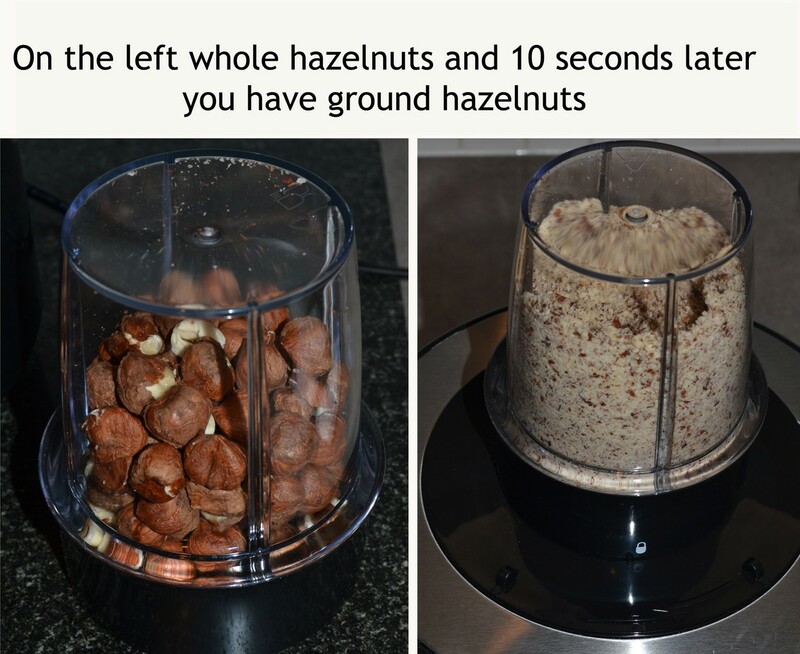 I ground up 100 grams of whole hazelnuts in just under 10 seconds (see photos). Liquidiser A large heavy glass liquidiser (many of the competition use plastic) for sauces, soups, milkshakes etc. 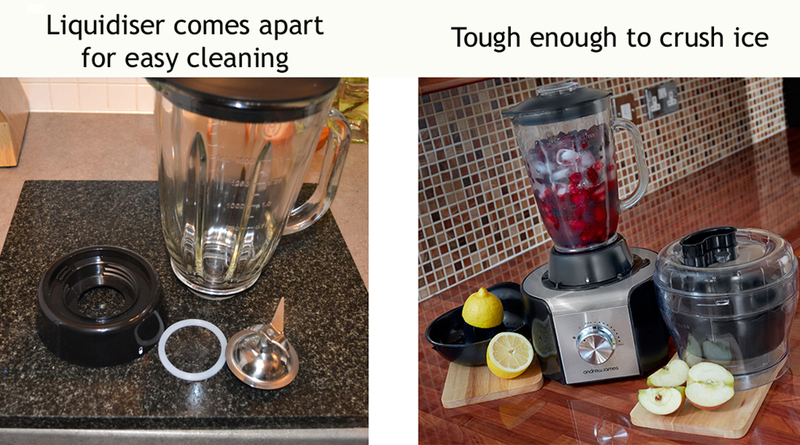 It can even crush ice cubes because of the powerful motor, and comes completely apart for effortless cleaning. A Citrus press to squeeze oranges, lemons etc. 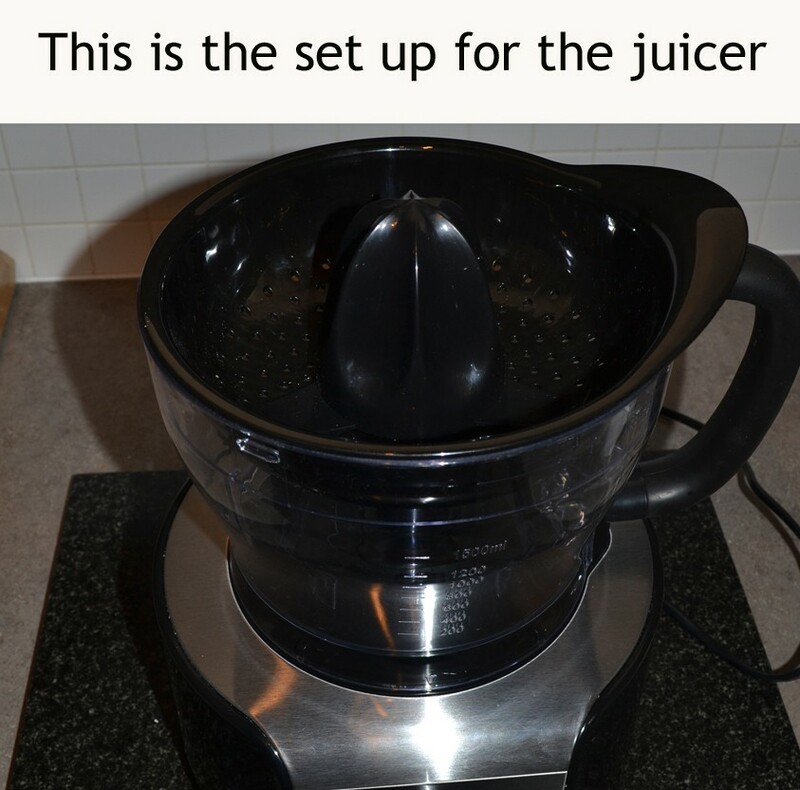 The juicer sits onto of the large bowl and has to lock into place by the handle so you can switch it on. 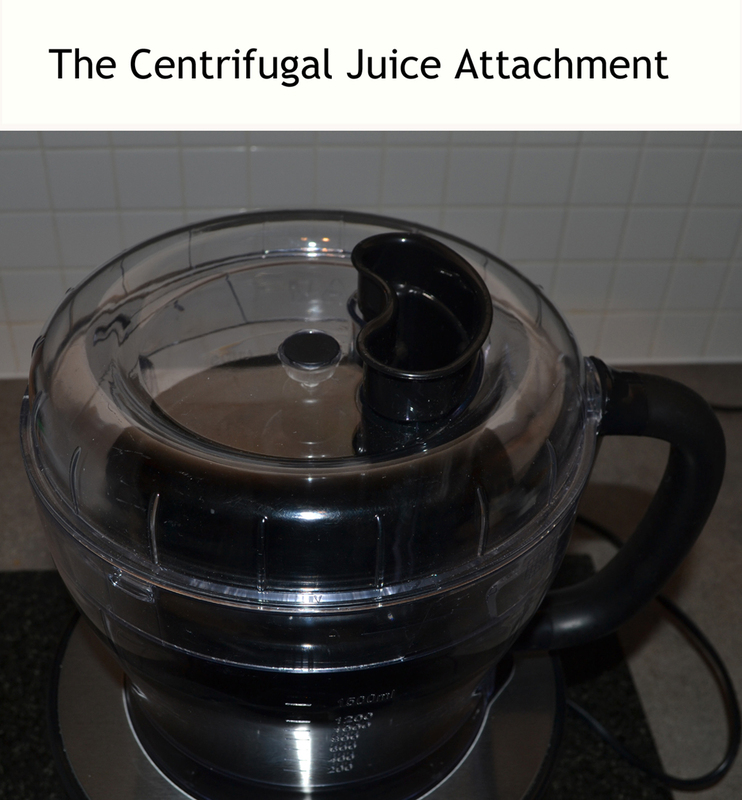 A Centrifugal juicer for making juice from firm fruit and vegetables, so if you are serious about juicing then this will do the job. I used beetroot, carrot and citrus juice to create a great after workout energizer. 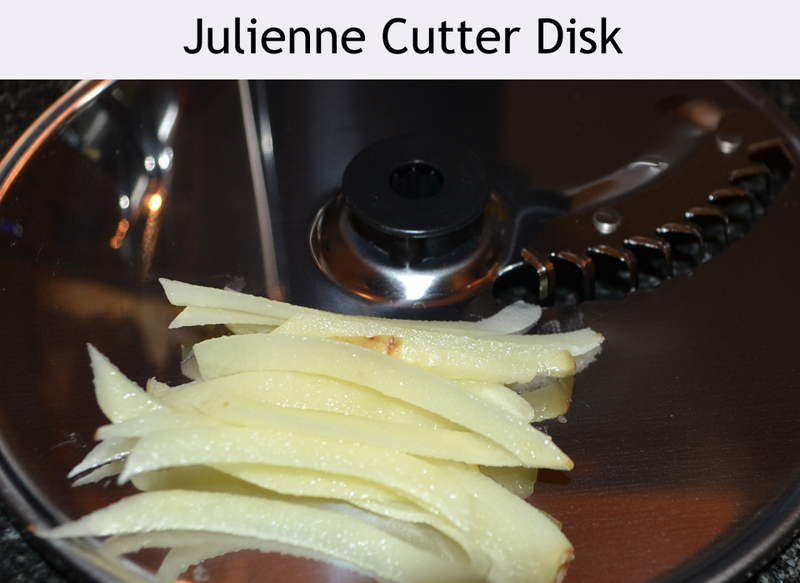 The Julienne cutter disk is pretty self-explanatory and cuts vegetables or fruit into long thin strips. 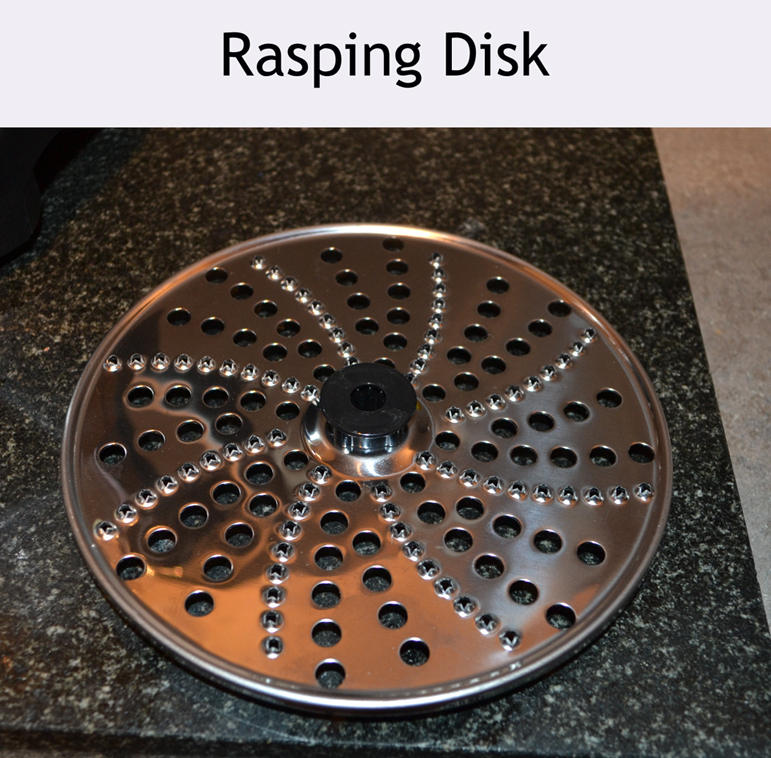 The Rasping Disk is ideal for grating parmesan cheese or hard stale bread you wish to turn into breadcrumbs. 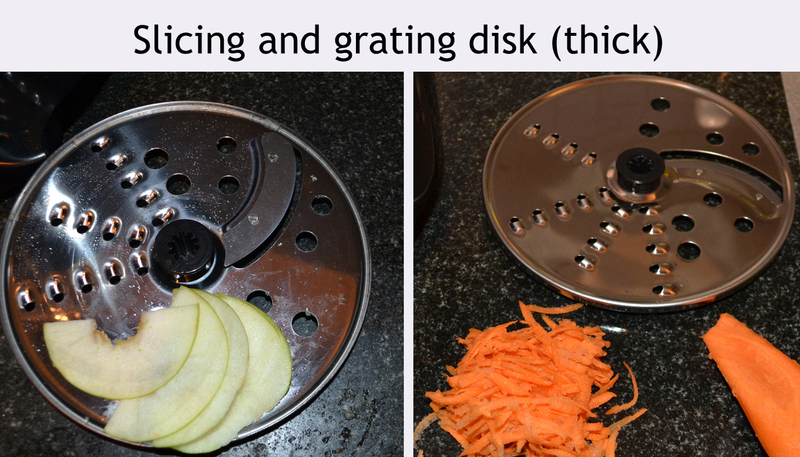 The remaining two disks can both slice and grate, one for thick slices and one for thin. 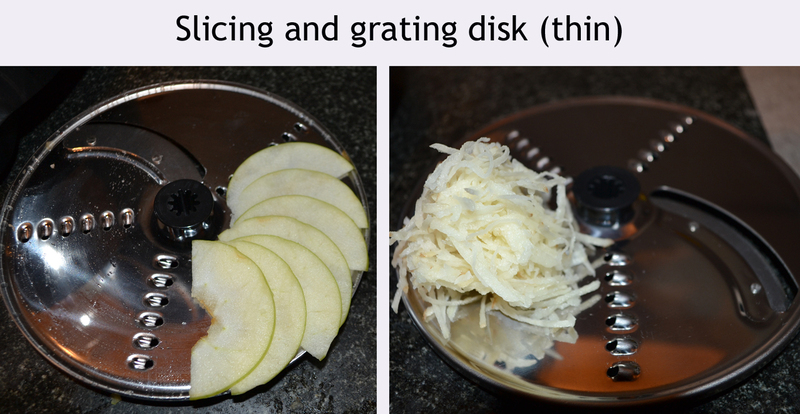 These two disks are reversible when you use the one side you get slices and then when you turn the disk over you get grated. It is easy to tell which side does which action. The side with the rough grating holes is the grating side. Dough Tool I have used this several times when I want to throw together a quick pizza. I can put the dough on to knead whilst I get on with making the tomato sauce. I was quite surprised I could fit my normal recipe in that makes 2 x 24cm pizza base’s which enough pizza for most families. 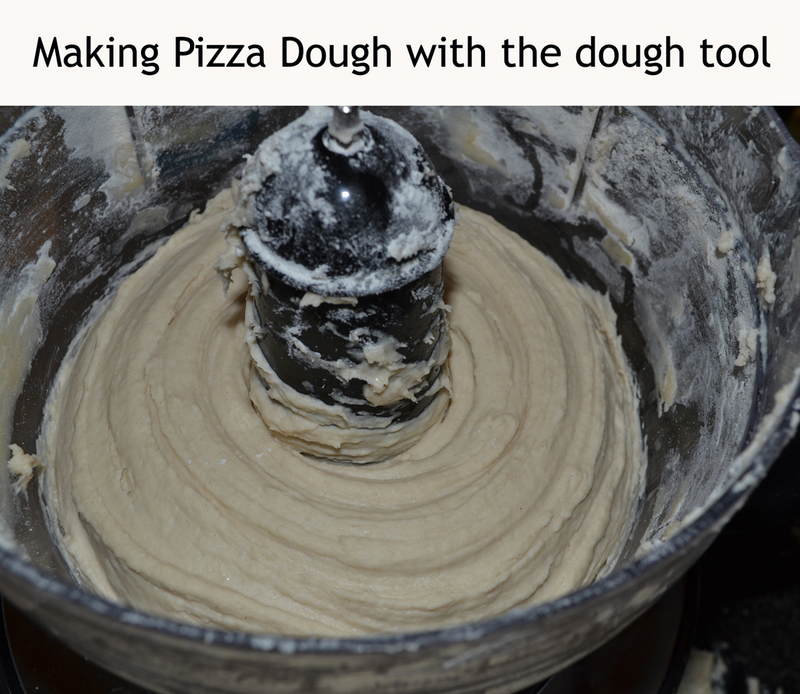 After kneading the dough in short bursts for 10 minutes, I transferred it into a large bowl, covered it and left to prove. I went off to pick my wife from work, went swimming and got back about 2 hours later and it was ready to roll out and use. Value for money, design, build quality, wattage, noise level, keeping clean and warranty. Wattage: At 800 watts of power you are getting plenty of power to do the job. Keeping Clean: Again this is another thumbs up for the design team that have made this food processor easy to clean, and keep clean. Which in itself is no small feat, there are thousands of food processors sitting in cupboards never used because it takes longer to take apart and clean than use. But not with Andrew James, it was easy to take apart and very easy to clean even items like the liquidiser disassembles completely. 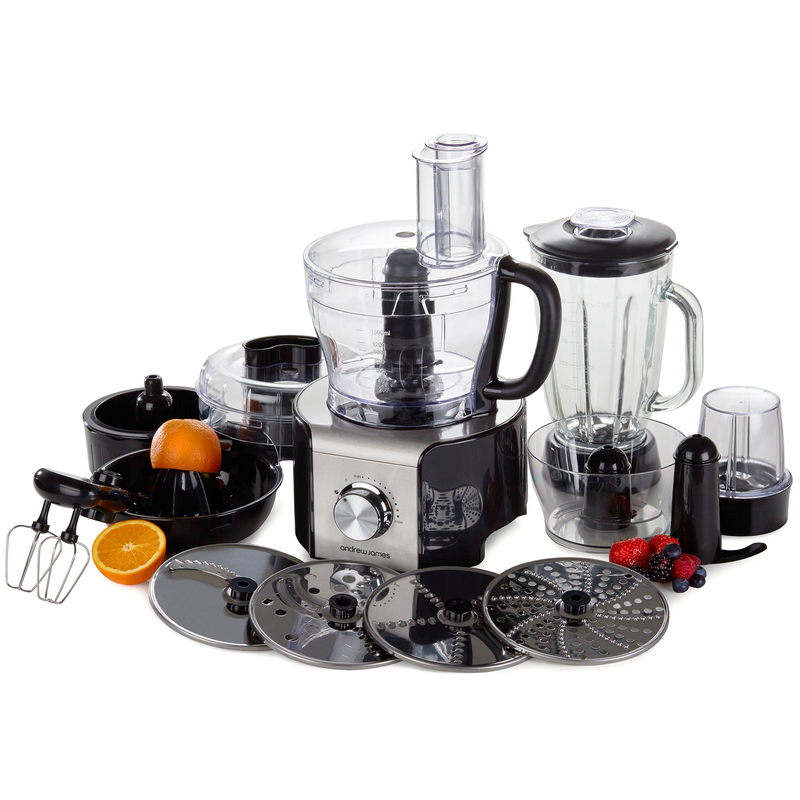 If you are looking for the biggest, sturdiest food processor for a low price, this Andrew James Multifunctional Food Processor should be top of your list. Glass instead of plastic liquidiser will give you years of use. Easy to put together even if you are a person who never looks at the manual. A grinder capable of grinding coffee beans, a liquidiser able to crush ice cubes, well designed as we have come to expect from Andrew James. The people who write the manuals for Andrew James need to up their game because there are several glaring mistakes, such as text that states the liquidiser “comes already assembled and the bottom is not removable”. And yet it is indeed removable and thus easy to clean. *I’m not a big fan of food processors with small flimsy whisk attachments. Yes, they can be used to whisk eggs and or egg whites but the capacity is too small. Most people me included will end up using other appliances to whisk with. This review was originally posted on my other blog here which also has the comments on it.